I was addicted to Roald Dahl as a child. Matida, the BFG, Esio Trot, Danny the Champion of the World – every one a classic and a fond memory. Snozzcumbers, anyone? My parents have a memory of looking back into the backseat of the car on a very long journey when it had been ominously quiet for a while to see my brother and I sitting like pale, terrified mice listening to The Witches on tape. I have, however, never explored Dahl’s adult writing. I think someone told me at an impressionable age that his adult stories were even scarier than The Witches, and I knew when to accept defeat. However, this book of short stories has been on the list and so, dear reader, I plucked up my courage and dove in. Like Dahl’s children’s books, the writing is brilliant. The characters are painted so vividly and the evil creeps in so slowly that, by the time you and the characters have worked out what is happening, it is all too late. One of my favourite aspects of these stories is their final sentences. They really are masterful in bringing the tales to a close with a sting. The collection is reassuring Dahlian in many respects, not least that, much like in his children’s books, the baddies generally get what is coming to them. The stories vary from the fantastical to the chillingly believable, but possibly my favourite was the story Katina, set during the war in 1941. This stands out from the others as being not creepy, but rather deeply moving and poignant. The collection has been pulled together to appeal to teenagers, but even as an adult I fully enjoyed them. I just wouldn’t recommend them to any young teenagers….unless they are substantially braver than I was. Although, maybe that isn’t saying much. Magic card being used as a bookmark, so I suspect I may have purloined it from my brother during a sisterly raid of his bookshelves which I may never have confessed to. Good thing he is very good natured! 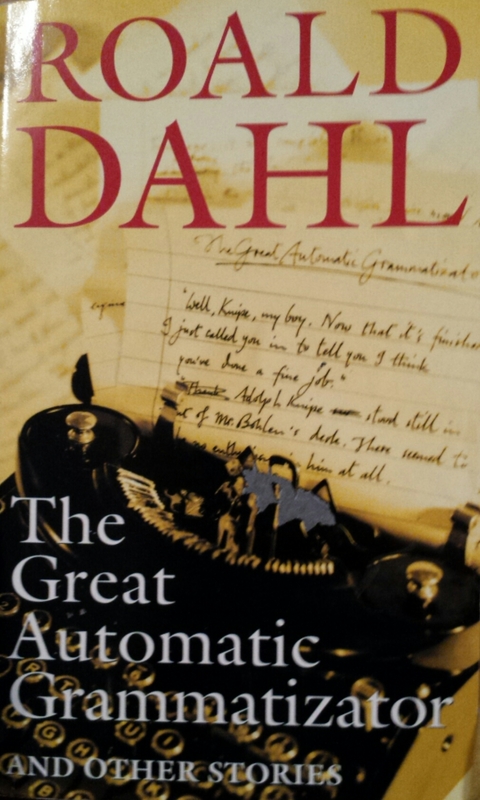 Tags: book, book review, books, Fiction, roald dahl, short stories, the great automatic grammatizator. Bookmark the permalink.